National Day is annually observed on Seychelles on June 18. This holiday celebrates adoption of a multi-party democratic constitution in 1993. 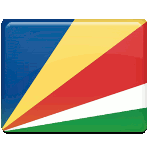 Seychelles were granted independence in 1976 and became a republic within the Commonwealth. Since then Seychelles were a socialist one-party state. This political course lasted till 1991, when the government was forced to move to multi-party system. These changes became the basis for a new constitution. Its first draft failed to receive the requisite 60% of voters. An amendment was made, and a new constitution was approved in 1993. Celebration of National Day is associated with an annual military parade. This parade is attended by top dignitaries, President, Prime Minister, Police Commissioner etc. Helicopters carrying national flags are often seen during the parade. After the parade President of Seychelles addresses the nation in his speech. An official celebration of National Day includes music concerts, but the most interesting and exciting part of the festival is a flower show.